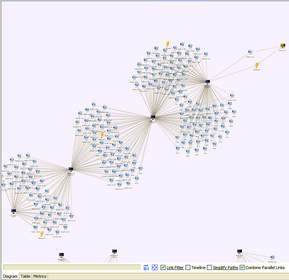 SAN FRANCISCO, CA--(Marketwire - Feb 26, 2013) - RSA Conference -- 21CT Inc., provider of investigative analytics and pattern-detection solutions, today announced enhanced graph search capabilities for LYNXeon™. Challenged by commodity tools that simply regurgitate log data, enterprises and government organizations need more effective and efficient solutions that can turn big data into big insight. Using the newly enhanced LYNXeon graph search, these organizations now intuitively correlate and visualize data to detect never before seen patterns and gain the operational insight needed to identify embedded cyber attackers, detect fraud, and document criminal behavior. The company also announced today an additional patent award (U.S. Patent 8,316,060) for rapidly and efficiently performing graph searches on massive data sets, a key technological advantage in 21CT solutions. "Machine-based attacks can be caught by machines, but today's advanced human-based attacks, whether cyber or physical, require hunters," said Robert Williams, Chief Product Officer, 21CT. "Global organizations and governments have teams of analysts and investigators that use data analysis to hunt out and mitigate cyber attacks, fraud, and criminal behavior. These hunters don't care about the marketing buzz of Big Data, they want big insights in order to detect patterns and get to the right answer, faster. The new LYNXeon graph search capability brings data analytics to a new level, efficiently providing visibility into the links that a hunter can use to get answers and doing it in a fraction of the time of legacy or homegrown solutions." To understand how 21CT's investigative analytics and pattern-detection solutions can enhance your intelligence-driven security, schedule your LYNXeon demo today. 21CT Inc. investigative analytics and pattern-detection solutions secure your world. Using LYNXeon from 21CT, organizations rapidly import enriched and disparate data, analyze and visualize it to find previously undetectable patterns, and gain the operational insight needed to identify embedded cyber attackers, detect malicious fraud, and document criminal behavior. For more information and to find out how we can help secure your world, visit www.21CT.com. About this company 21CT, Inc. Using the newly enhanced LYNXeon graph search, these organizations now intuitively correlate and visualize data to detect never before seen patterns and gain the operational insight needed to identify embedded cyber attackers, detect fraud, and document criminal behavior.